Nagoya, Japan – A novel cesium-transporting bacterial pump developed by researchers at the NITech could be beneficial in radioactivity decontamination efforts. These findings were recently reported in The Journal of Physical Chemistry Letters. 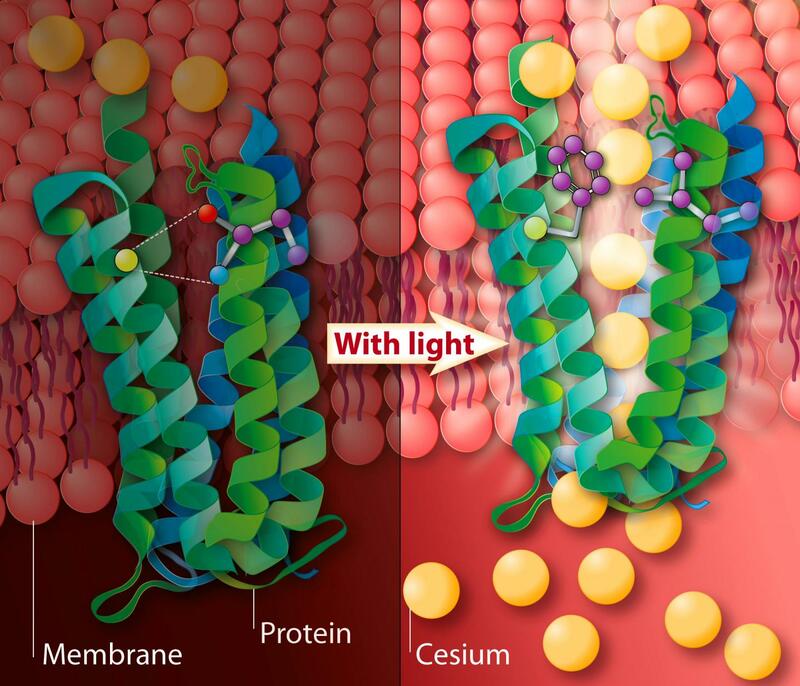 The NITech-led team, in collaboration with colleagues at The University of Tokyo, successfully induced a molecular pump found in bacteria to transport cesium. The process simply requires the presence of light to make it function. The finding could pave the way for a new means of extracting cesium from the environment, potentially speeding up decontamination efforts following the radioactive fallout from the Fukushima Daiichi nuclear disaster in 2011. This work focused on rhodopsins, which are light-activated molecules found in the human eye as well as in bacteria. Rhodopsins have been found capable of pumping anions or cations into or out of cells, respectively–activity important for maintaining various cell functions. In this study, the team worked on a rhodopsin from a marine bacterium, which normally pumps sodium, as well as lithium, across the cell membrane. Earlier studies had identified the particular building blocks within the middle of this pump that are vital for it to transport only those ions it is meant to transport. Subsequent works applied this information to induce the pumping of potassium instead of sodium. Further progress along this line of study has now led to production of a cesium pump. This is a major breakthrough–no light-driven cesium pumps have been found in nature. "We were able to introduce a range of mutations at two positions within the rhodopsin protein from Krokinobacter eikastus, which are known to be important for its pump activity," lead author Masae Konno, from the Department of Frontier Materials at NITech, explains. "When the mutated protein was then expressed in E. coli, we were able to see the concentrations of different ions in solutions in which they were suspended. Changes in these concentrations indicated successful pump activity, and could be used to quantify the pumping efficiency." The research team was also able to identify the exact mechanism of the pump's targeting and transport of particular ions. They found that the two mutated positions correspond to the narrowest part of the channel through which ions pass. When bulky amino acids are introduced at these positions, the channel width no longer corresponds to the size of sodium ions, and instead cesium ions are transported. The authors are optimistic about the potential for using this finding in real-world applications. "Being able to use the pump to collect radioisotopes from the environment is truly significant," they say. "For example, a substantial amount of cesium-137 was released after the Fukushima nuclear disaster. This radioactive isotope has a half-life of 30 years. The large-scale production of this protein would be a great help in decontaminating the affected areas."